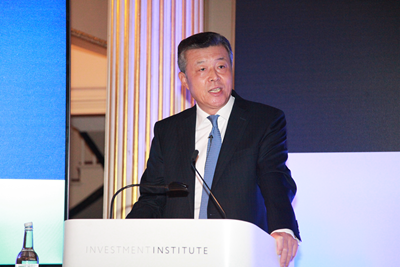 It gives me real delight to join you for the 2016 Investment Institute Forum to discuss, as the theme of the forum suggests, "Long-term Investing for a Sustainable Future". Here, the two key words are "long-term" and "sustainable". They are the very questions on the minds of international investors in relation to the global economy and its prospects. Those who do not consider the whole picture can hardly manage one aspect. Those who do not plan for the future can hardly seize the moment. 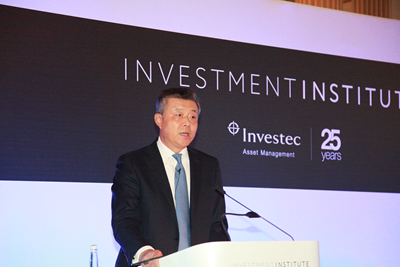 I want to commend our host Investech for laying focus on long-term investment in the Belt and Road building. May I say you have demonstrated business acumen and strategic vision. I was asked to talk about the significance of the Belt and Road Initiative and what it means to the world. The "Belt and Road" is short for the Silk Road Economic Belt and the 21st century Maritime Silk Road. It was first proposed by Chinese President Xi Jinping three years ago during his visit to central Asia and southeast Asia. Since its inception, the Belt and Road, like a seed, has grown fast and started to bear fruits in more and more countries. Today, the Belt and Road has become a hot topic around the world, especially among international investors. So what is the significance of the Belt and Road Initiative? What does it mean to the world? First, the Belt and Road Initiative is a comprehensive and timely response to the need for cooperation. The historical Silk Road is a valuable cultural heritage. For centuries it has been known for being a vehicle of peaceful cooperation, openness, inclusiveness, mutual learning and mutual benefit. China launches the Belt and Road Initiative in the same spirit. It embodies the oriental wisdom of inclusiveness and harmony. It highlights the importance of shared interests and is in line with the trend of open and inclusive cooperation. It also answers to the call of countries around the world, particularly in Eurasia and Africa, for closer and win-win cooperation. Many of the countries along the Belt and Road routes are abundant in natural and human resources but are in need of capital, technology and infrastructure. According to statistics, as of 2020, a total of eight trillion US dollars is needed for building domestic infrastructure in Asia. The existing financing capabilities are far from meeting such huge needs. The Belt and Road Initiative is launched to provide a solution to this problem, by aiming to foster policy coordination, infrastructure connectivity, unimpeded trade, financial integration and people-to-people bonds. If these five goals are achieved, the bottlenecks that once hinder development can be removed, market resources can realize their potential, and common prosperity and regional economic integration will become possible. It was against this backdrop that the Asian Infrastructure Investment Bank was founded. It has since got the recognition, response and support from more and more countries. Second, the Belt and Road Initiative aims to deliver tangible benefits to all parties and will take a step-by-step approach. Over the past three years, there have been a series of substantial early harvests already. One example is in the field of trade and investment. In the first three quarters of this year, China's trade with and investment in countries along the Belt and Road totaled 689.9 billion and 11 billion US dollars respectively. A total of 74.6 billion dollars of contracts were signed. And 17.9 billion dollars have been invested in more than 50 business cooperation zones in these countries, creating more than 160,000 jobs locally. Progress have also been harvested in the field of infrastructure connectivity. Construction of the Hungary-Serbia Railway and the Jakarta-Bandung High Speed Rail have already started. Projects forming the pan-Asian railway network, including China-Laos and China-Thailand rail, have been launched. A number of motorway projects are making good progress and plans for maritime connectivity are in the pipeline. The China Railway Express has to date made over 1,500 routine journeys over land between China and Europe. The connectivity network that links the Eurasian continent by land, sea, air and internet is gradually taking shape. In financial services, the AIIB is open for business. The first projects with investment from the Silk Road Fund have been launched. In the field of cultural cooperation, a number of ancient sites along the Silk Road have been included in the UN cultural heritage list, based on joint application filed by China and relevant countries. The building of the Belt and Road is advancing steadily, evidenced by these substantial early harvests. In the years ahead, it will continue to deliver even more tangible benefits to countries along the routes and to all the participants involved. Third, the Belt and Road Initiative opens unlimited possibility for innovation. Last March, the Chinese government issued the document called Vision and Actions on Jointly Building Silk Road Economic Belt and 21st-Century Maritime Silk Road. This government paper offers a preliminary plan to gather international consensus. To this day, China and over 30 countries along the Belt and Road routes have signed cooperation agreements. More than 100 countries and international organizations have taken part in various ways. The scale and potential of the Belt and Road is clearly shown in a number of aspects. First, regional trade and investment growth is almost twice the global average. All the parties involved are working on better ways to facilitate trade and investment and exploring different types of free trade zones and regional integration process. Second, the AIIB's official opening started enthusiastic discussions among countries along the Belt and Road routes. 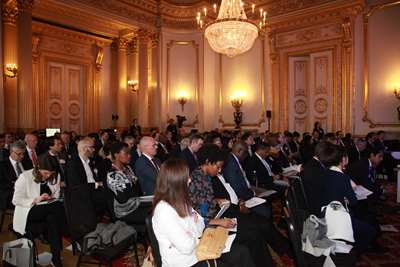 There is a high level of interest in building or expanding bilateral and multilateral financial cooperation funds. This will be a further encouragement for more companies and capitals to join in. Third, China will continue to increase investment in the building of the Belt and Road and explore new models of cooperation with Belt and Road partners. We would explore the idea of a "green Silk Road" to deepen cooperation on environmental preservation. We would consider a "healthy Silk Road" to strengthen cooperation on medical services and health. We would build a "smart Silk Road" to enhance cooperation on personnel training. Effective cooperation along the Belt and Road will greatly accelerate the industrialization process in Eurasian countries and improve their capability for independent development. This will help revive the regional and global trade and investment. This will help advance the world economy towards balanced development and shared benefits. There is no limit to what companies can do and achieve here. The Belt and Road will surely be a major contribution to regional cooperation and global growth. And, I would like to underscore a very important point. That is, the Belt and Road Initiative is not an attempt to replace any existing regional cooperation framework. It is a complement to them. It aims to dovetail the development strategies of all participants inside or outside the region to deliver win-win outcomes. It is not a private footpath that permits no trespassing. It is a highway open to all. The Belt and Road Initiative is open to everyone wherever you are from. Both China and the UK are countries of global influence. Last October, President Xi Jinping paid a successful "Super State Visit" to the UK which unveiled the "Golden Era" of China-UK relations. During the visit, China and the UK reached important agreement on dovetailing our respective development strategies, namely, China's "Belt and Road" Initiative and Britain's "Northern Powerhouse". At present, China and the UK are working together to build the "Golden Era" of our bilateral relationship and to take our global comprehensive strategic partnership to a higher level. Early this month, China's Vice Premier Ma Kai and Chancellor Philip Hammond co-chaired the eighth China-UK Economic and Financial Dialogue in London. The two sides had in-depth exchange of views on macro-economic development, trade and investment, financial services, infrastructure, etc, and reached 63 cooperation outcomes. Notably, the Belt and Road collaboration is one of the outcomes. The UK's clearly defined role as an important partner of the Belt and Road Initiative will add new momentum to China-UK cooperation. 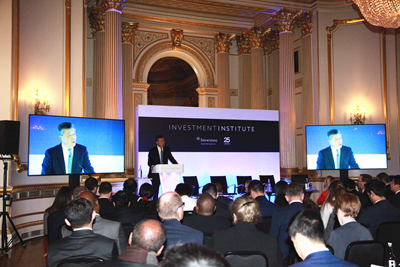 During the Dialogue, Chancellor Hammond announced the UK government's decision on 40 million pounds capital injection in the AIIB, making the UK the second contributor after China. The money will go to a special fund for financing infrastructure projects in developing countries. I am told that you represent the financial institutions that manage a total of one trillion US dollars in available capital. I would say that where your investment goes will have far-reaching impact on global economy. And I hope that after my briefing, you would have some idea about the value of investing the Belt and Road. Then comes the question of how to get involved in the Belt and Road cooperation. I think opportunities for cooperation lie in four areas. First, the opportunities come from dovetailing development strategies. We need to identify specific areas in our respective development strategies where we can cooperate to expand our common interests. For China and the UK, we are now working actively to dovetail China's "Belt and Road" Initiative and "Made in China 2025" with Britain's "Northern Powerhouse" and "UK Industry 2050". The key projects involved are nuclear power, high speed rail, infrastructure building, etc. The Hinkley Point C Nuclear Power Project, approved by the British government not long ago, is the largest single investment that China has ever made in the UK and Europe. This project will create more than 20,000 jobs and provide millions of British families with reliable energy supply. Finding a match in our respective development strategies will not only help expand the size of our bilateral investment and trade. This will also open up possibilities for a higher-level trade and investment arrangement between our two countries. Second, the opportunities exist in the area of professional services, such as finance and law. The building of the Belt and Road needs enormous financial support. The construction, trade and business activities will generate a huge flow of capital, together with tremendous need for professional financial, legal and consulting services. There is the definite need to establish financial service platforms in countries along the Belt and Road routes as well as to gradually put in place a sound legal system. Britain has rich experience in international financing and a comprehensive and sophisticated service sector. Britain has close financial links with countries along the Belt and Road routes. Britain is also a world leader in international commercial arbitration and disputes settlement. In the long run, China and the UK have much to achieve through cooperating and investing in financial and legal services for the Belt and Road cooperation. Third, the opportunities lie in jointly developing third country market. In recent years, Chinese companies are increasing their international presence. They are looking for new models of cooperation, such as developing the market in a third country in cooperation with the UK. Britain has close links with many countries along the Belt and Road routes, especially the Commonwealth countries. British businesses are experienced and well-based in market development, project management, project monitoring and risks control in these countries. There is very real benefit for our businesses to join hands and develop the market in countries along the Belt and Road routes. But our cooperation is not only for the interests of China and the UK. We can do more than that by ensuring the people of the third country that hosts us will also benefit enormously from our cooperation, thus producing an outcome that is "one plus one is greater than two". Fourth, the opportunities come with people-to-people and cultural exchange. Stronger people-to-people bonds is one of the five goals of the Belt and Road Initiative. China and countries along the Belt and Road routes have been enhancing cooperation in education, science and technology, culture, tourism, health and archaeology. We are building a Belt and Road think tank network together through the establishment of a big-data exchange platform. Britain has language advantage and boasts many world prestigious think tanks and world class education resources. China and the UK can work together to offer brain support to the building of the Belt and Road. This will open a door to more possibilities for international investment cooperation. As cooperation along the Belt and Road expands and deepens in the future, there will be more cooperation opportunities for international investors. Of course, with investment come risks and challenges. The Belt and Road will not be an exception. Countries and regions along the Belt and Road routes are vastly different in their level of development. In some part there are geopolitical complexity and volatility. The international economic and financial environment is vulnerable to instabilities and uncertainties. Investors should be cool-headed, be aware of possible risks, make plans for eventualities, and increase risk-proof capability. "The best way to predict future is to create it." You are all leaders in the international investment sector. I hope you will seize the opportunities brought about by the Belt and Road Initiative. I hope you will contribute your wisdom and strength to the Belt and Road cooperation. I hope we will work together to create a better future. In conclusion, I wish today's forum a complete success.